The Chinese year 4075, the Year of the Pig, starts on February 18. To get an early start on preparing for the celebration, this month's featured project is A Chinese New Year Journal and the links lead to sites with information about Chinese writing and calligraphy. The Chinese New Year Journal is one of the five projects in my ebook, Gung Hay Fat Choy: Making Books for Chinese New Year. Use a chop stick for the stick. Red is a lucky color in China and a good choice for the cover. 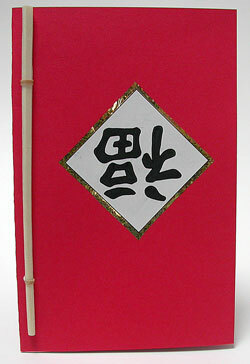 The characters on the front are fu, the word for luck in Chinese. At New Year, the word is hung on the door upside down to say that luck has arrived. You can print out a Fu pattern to glue on the cover. This is a good basic introduction which would be accessible to kids. For a deeper look at writing Chinese characters, take a look here. A selection of single words written by masters of Chinese calligraphy illustrate a variety of styles. The idea here is not to learn how to write with a brush, or what the words are, but just to look at them as an abstract art. If you follow the arrow at the end of the page, you'll get to more information about Chinese calligraphy including the work of masters, essays, and links. These signs from the Hong Kong subway are beautiful to behold. Enter your name, birth date, desired essence of the name, and gender and get your name in Chinese.